Got to love Steampunk Arcade, I especially love the hand turned items. 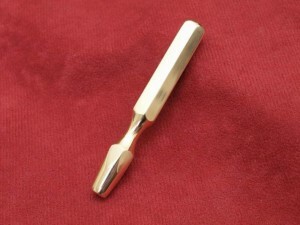 Like this brass pipe tamper. This pipe tamper has been lathe turned from one piece of solid hexagonal brass bar which I have machined to a nice polished finish. It measures three inches in length with a diameter of three eights of an inch, and this one will not roll off the table. A retired mechanical engineer, Steampunk Arcade currently resides in the UK. Also love this steampunk stash necklace. 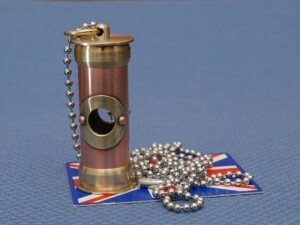 This super Steampunk stash necklace has been constructed from copper and brass components, the brass parts having been torch soldered together for durability in the field. Measuring two inches long (not including the suspension ring), it has a glass tube insert with an inside diameter a little under half an inch. The end cap has a tight, push-on fit to keep whatever you may put in it safe from the elements, and it comes with the 27″ stainless steel ball chain shown. The stash capsules I make are all handmade individual designs, so unlike the mass produced factory made ones, that are churned out on on automatic computer controlled lathes, they are open to endless variations of form, so no two will be exactly the same. I love steampunk, which in short is sort of a science fiction fantasy with the class and character of the Victorian era. Steampunk has evolved into many different things over the years, however I enjoy the fact that most of the items have a real use. Dual purpose items that look like art is the way to go. Something that is pretty is fine, but something that is pretty and useful is hands down the best. Life is too busy for useless clutter. Nice piece and beautiful work!